Why do I need to have my timepiece restored or overhauled? What is a quality overhaul/ restoration? What do I do for daylight saving? Where is the best location for my clock? How to I wind up my clock? How do I correct the strike or chime? How do I regulate my pendulum clock? How do I regulate a balance wheel clock? What are the warranty terms and conditions for watches? What are the warranty terms and conditions for clocks? Due to the high quality of mineral and synthetic oils used today timepieces can run for extended periods without stopping due to oil degradation. The drawback is that most timepieces run well past their recommended service date and as a result, damage to components is accelerated. A timepiece needs to be overhauled not only to rectify wear but also to remove the old contaminated oil. A timepiece should be serviced at a regular interval to avoid unnecessary wear. Any clock whether its value is intrinsic or sentimental should be overhauled approximately every 15 years and re-oiled every 4 years. A watch should be overhauled approximately every 8 – 10 years. The oil dries out and the wheels cannot rotate. The clock has been oiled many times and the excessive amount of oil has spread across the wheels increasing the friction to the point where the movement stops. What is an overhaul/ restoration? Inspect the teeth of the wheels and pinions for wear or damage. Re-bush any pivot hole that shows excessive wear. Carry out any other repairs that may be necessary. Carefully clean out the pivot holes. This should be done twice to ensure all remits of dirt have been removed or else the new oil will be contaminated right from the start. Place on test bench for minimum of one week to determine if there are any problems. Clean the case thoroughly. Vacuum the inside to remove any dust and clean exterior. When happy with the movement assemble movement with the dial and place into the case. Run the movement for minimum of one week to check running correctly and time the clock. From the tasks outlined above it can be clearly demonstrated that for a timepiece to be overhauled properly, it is time consuming and the process cannot be sped up without compromising the quality of workmanship. The general rule for most clocks is not to turn the minute hands backwards past the striking or chime activation points (12, 3, 6 and 9). By doing so this can cause mechanical damage to the levers in the clock. If your clock is running fast by a few minutes. Note: if you turn the hands backwards when the minute hand is near the activation points you may cause the clock to chime/strike. If your clock is non-synchronising you will have to rectify the problem. As a general rule advance (clockwise) the minute hand to the correct time stopping at each activation point to allow the chime/strike to complete its sequence. A mantle clock should be located on a solid level surface, free from air currents. Avoid areas that can cause heat and vibration such as electric appliances and pianos. Wall clocks should be located on a wall that does not shake or vibrate when doors are closed or when people walk on the floor. For clocks with open pendulums (cuckoo clocks) be sure that the location is not susceptible to drafts, such as warm air registers and ceiling fans. Floor clocks should be anchored to the wall where possible. Carpet will allow the clock to sink and tilt and become out of beat. When setting a floor clock on carpet, it is best to anchor it to the wall or set it on a solid base. Floor clocks that are not attached to the wall securely can stop every time the weights and the pendulum are in close approximation. Even if the clock ran satisfactorily prior to restoration it is very likely that it will no longer operate. Sympathetic vibration of the weights and case will cause the pendulum to be robbed of its momentum thus causing it to stop. All spring driven clocks need to be wound the correct amount or else the clock will not run correctly for the seven days. Winding must be done consistently and be counted in the process to ensure the correct amount of winding takes place. Please note that each clock may be individually different and that the instructions below are of a general nature. Winding is generally explained in terms of the number of half 'turns of the winding key'. A half turn is a rotation of the wrist whilst grasping the key. Usually need 15-half turns per week but may need as much as 25-half turns if it has been allowed to wind down. Some German chiming clocks need to be wound a different amount on each winding arbour. 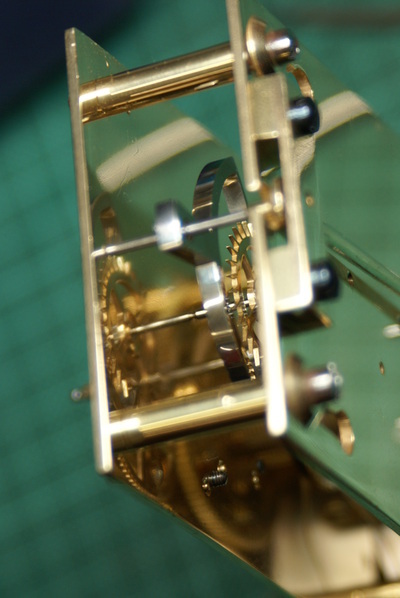 This is due to additional gears being added to the mechanism to allow the winding arbours to be located closer to the centre of the clock. In some clocks one winding arbour need to be wound 8-half turns while the other 16-half turns. Usually needs about 28-half turns per week or 32 ½ half turns if allowed to wind down. Note: Do not wind with such force towards the end of the winding cycle, as this can cause the mainspring to be ripped off its hook and significant mechanical damage be caused. Always count the number of winds, as this will indicate how far you are away from the end of the winding cycle. All weight driven clocks must not be wound so that the pulley / weight is jammed up against the seat board of the clock. By doing so it makes removing the weight impossible if the clock needs to be serviced. Always allow sufficient room between the seat board and the pulley. For these clocks, turn the minute hand forward (clockwise). If you have a clock that strikes on the half hour and hour, be sure to stop at the 6 and 12 o’clock positions to let the striking cycle complete. If the striking does not match the hand setting, for example, your clock strikes 3 o’clock when your hands are at 5 o’clock, then use the trip wire inside the case to let the striking mechanism catch up. For these clocks, turn the minute hand forward or clockwise. If you have a clock that strikes on the half hour and hour, be sure to stop at the 6 and 12 o’clock positions to let the striking cycle complete. If the striking does not match the hand setting, for example, your clock strikes 3 o’clock when your hands are at 5 o’clock, turn the minute hand clockwise up to the point where the clock is ready to strike (usually this is at 1 or 2 minutes before the hour) then move the minute hand backwards until the clock strikes (this might be back 20 minutes). The clock will strike, by repeating this process the strike will advance until it is striking in alignment with the hands. Note: if the clock starts to strikes before you have moved the hands backwards stop and start the process again i.e. move the minute hand clockwise to the start again. For these clocks, turn the minute hand forward (clockwise) stopping at each quarter hour allowing the chime melody to play before advancing the hands. If your chimes are out of synchronization, set the time to the 15 minutes after the hour setting (1/4 after hour or at the 3) and listen to the notes. If you do not hear four descending notes, you must turn the minute hand to approximately 25 minutes past the hour and then turn the hand backwards. Repeat this process until you hear the four descending notes at the quarter hour setting. 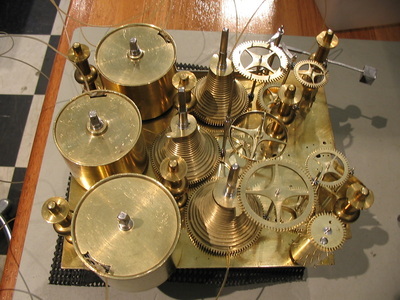 Most chiming clocks have self-synchronizing chiming mechanisms. If you have this type of clock, all you need to do is to set the correct time and the chimes will correct themselves in about 2 hours. If the hour striking still does not match the hand setting, then the hour hand (short hand) was inadvertently moved. In this case, carefully move the hour hand (short hand) to the hour that just struck. Please refer to the above information that pertains to your clock as indicated by the clockmaker. When changing the melody of the chimes, avoid moving the selection lever when the clock is within 5 minutes of chiming, i.e. the hour and quarter hour positions. It is best to move the selection lever just after the chiming has stopped at the quarter hour and never during the chiming cycle. Most pendulum clocks can be adjusted to keep time within 1 - 5 minutes per week. Changing the rate of timekeeping is simple. To speed up the clock the rating nut is turned to the right which causes the bob to be raised; to slow the clock down lower the pendulum bob by turning the rating nut to the left. Move the pendulum a small amount at a time and at the start of the winding cycle. Making adjustments at the end of the week on a spring driven clock is not advisable. Note: some pendulum bobs do not come down on their own accord and may need to be pulled down. When doing this be very careful to hold the pendulum rod as to ensure the fragile suspension spring at the top of the pendulum is not broken. For these clocks, you will raise and lower the pendulum by moving the pendulum bob on the rod directly. To speed the clock up, carefully grasp the pendulum bob and move it up the rod (toward the hanger) 1/8 to ¼ of an inch. Likewise, to slow the clock down, carefully grasp the pendulum bob and move it down the rod about 1/8 to ¼ of an inch. For these clocks, if you look on the dial of your clock, you will find a small hole with a square arbor. You will also find on the other end of your winding key, a smaller end to fit a smaller arbor. You will use this end and insert it into the square arbor on the dail of your clock. On your dial you will have markings for fast and slow indicated by “F, S, A, R” or “+” or “-“. If your clock is running slow, you would turn the key one full turn toward the “F, A or +”; likewise, if your clock is running fast you would turn the key one full turn to the “S, R or –“each week until the desired accuracy is obtained. A majority of French clocks do not have any marking on the dial to indicate which way to adjust your clock Clockwise will make the clock go faster and anticlockwise will make the clock go slower. The regulators do not have infinite adjustment and its important not to force the key around as it will strip the teeth and the regulator once it is at its limit. If the clock will not keep time and it has run out of regulation it may be necessary to adjust the pendulum bob or suspension spring. Discuss with your clockmaker prior. For these clocks regulation is carried out by adjusting a lever on the platform. On a carriage clock the lever is located at the back of the clock (top) when the door is opened. Other type of clocks may have an aperture that needs to slide open to gain access to the adjusting lever. The platform will have markings for fast and slow indicated by “F, S, A, R” or “+” or “-“. If your clock is running slow, you would push the lever to “F, A or +”; likewise, if your clock is running fast you would push the lever to “S, R or –“each week until the desired accuracy is obtained. Warranty period two years on mechanical repairs. No warranty on battery replacements unless quartz movement has been replaced or overhauled. Replacement leather bands are covered by manufacturer’s warranty (replacement only). Existing bands are not covered by any warranty. water resistance case restoration carried out (ie. crown seal, case lube, glass replaced). watch used within manufacturers guidelines. Note: Water resistance under 100 meters does not mean watch is capable of being submerged. Watches with water resistance over 100 meters generally can be submerged under certain conditions. Refer to manufacturer for water resistance specifications. 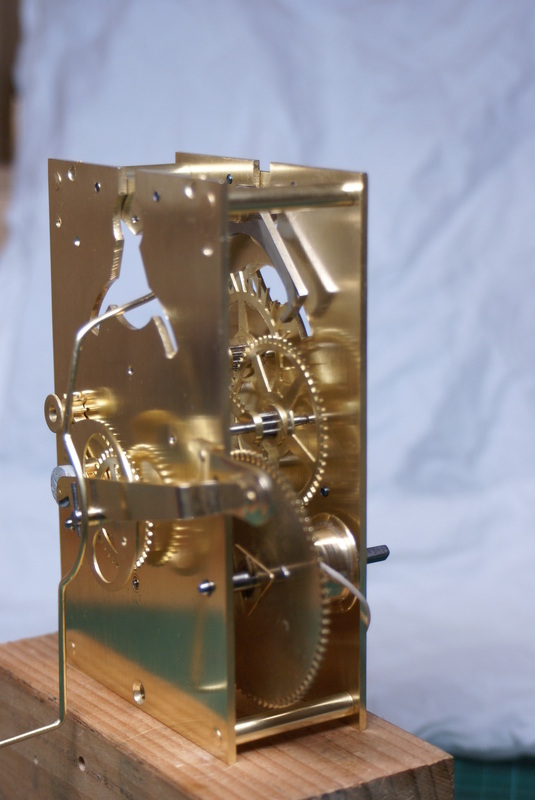 Warranty period 4 years for antique/vintage mechanical clocks. 12 months warranty on all quartz movements. 12 months warranty on modern clock movements (note factory warranty on Hermle and Kieniger movements is 6 months; we provide you with an additional 6 months). Mantel & wall clocks to be returned to Canterbury Clocks and Watches for any warranty work required. Warranty on long case and grandfather clocks will be carried out at customer’s premises up to 10km from Canterbury. 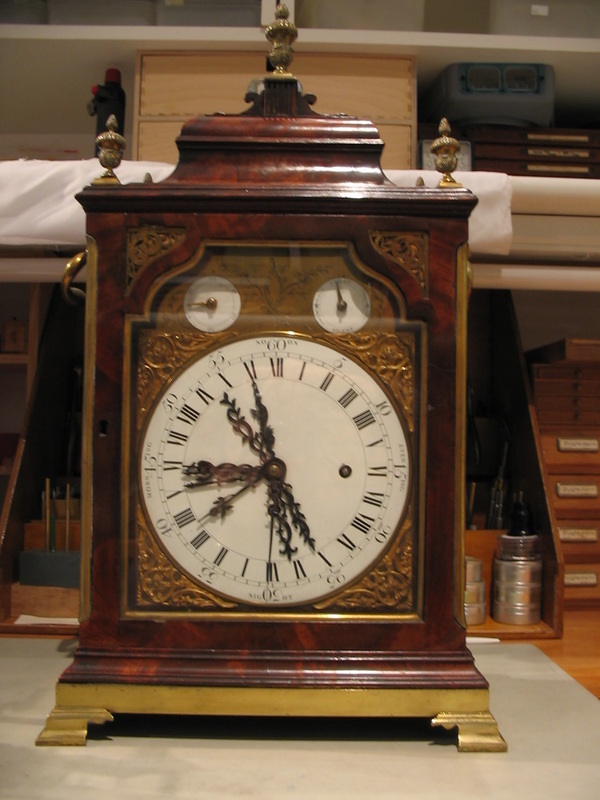 Canterbury Clocks and Watches may request long case/grandfather clock movements to be returned by customer to enable warranty work to be undertaken at shop. Warranty on long case and grandfather outside the 10km radius of Canterbury will be subject to service charge to cover travel expenses. Warranty specifically covers workmanship. Due to age of clock, warranty cannot cover worn parts that are not reasonably expected to be repaired/replaced during an overhaul/restoration i.e. pinions on most 100 year case clocks are worn and would not be replaced unless specified in the quote. In the event that it is found that the clock will not run due to a worn component, the customer will only be liable for the cost to fabricate the part. Sounds of strike/chime may differ due to replacement leather on hammers etc. Canterbury Clocks and Watches is not able to tune chimes/bells as this requires extensive musical knowledge.